I've lost track with all these coffee breaks, but I don't recall posting this cup. 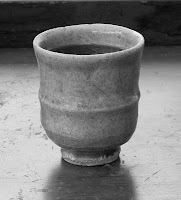 Here is a wonderful yunomi made by So. Georgia potter Mike Henshaw. I had mentioned Mike in an earlier post about woodcut prints. Mike made this pot at Penland in Shawn Ireland's studio at the Barns while Shawn and I were residents there. Shawn and Mike are good friends and Mike would come up to escape the heat of south GA and make pots with Shawn in the cool of the mountains. It has a beautiful celadon ash glaze and was fired in Shawn's wood kiln that he built(and still stands) behind the Barns studios. It's survived ten years of my kicking it around during my morning coffee. It has the signs of a well loved pot in its little chips and coffee stained glaze.